While North Korea conducted another underground nuclear test, some Russian officials and pundits express their concerns about the country's nuclear ambitions and call for economic sanctions. The Russian Defense Ministry has confirmed the nuclear test conducted by North Korea on Tuesday. "There was a blast," a ministry source told Interfax-AVN. The KCNA news agency of North Korea reported about the successful underground nuclear test on Tuesday. It said the test of the "miniature explosive device" was conducted precisely to plan. The South Korean Defense Ministry estimated the explosion carried out in North Korea at six or seven kilotons. When asked about accuracy of the South Korean estimates of the explosion's force, the source claimed "it was larger." The explosion's force can be estimated more precisely "after the data obtained by the Special-Purpose Control Service is processed," he added. The North Korean nuclear blast epicenter was one kilometer underground, yet no harmful atmospheric discharges have been detected, Roshydromet situational center head Yuri Varakin told Interfax on Tuesday. "Radiation levels are normal so far, which is proven with measurements done at stationary and mobile posts," Varakin said. "If any discharge or abnormal situation has happened, that would have been noticed. Tests are done underground to prevent atmospheric discharges and contamination." Russian chief public health official Gennady Onishchenko aslo confirmed that the nuclear test conducted by North Korea did not increase radiation levels in Russia. "Everything is normal and [the levels] correspond to the natural background," he said. Meanwhile, the Russian Foreign Ministry expressed indignation toward North Korea's stance. "We condemn this move of North Korea and view it in the context of the earlier test launch of a ballistic missile carrying a satellite as a breach of UN Security Council resolutions," a source from the ministry stressed. "We insist that the DPRK must stop the illegal activity, strictly comply with every directive of the UN Security Council, abandon its missile and nuclear programs and return to the NPT and IAEA guarantee regime," the ministry stressed. This is the only way North Korea may break free from the actual international isolation and get access to international cooperation projects in various areas, among them peaceful uses of atomic energy and space, it said. "We are confident that this path meets the interests of North Korea in the first turn," the ministry added. By conducting the nuclear test, Pyongyang "has once again ignored international legal norms and showed disrespect for UN Security Council resolutions." "This conduct is incompatible with the international co-existence criteria and doubtlessly deserves condemnation and an appropriate reaction from the international community. It is even more regretful that this country has long-standing neighborly relations with our state," the ministry remarked. 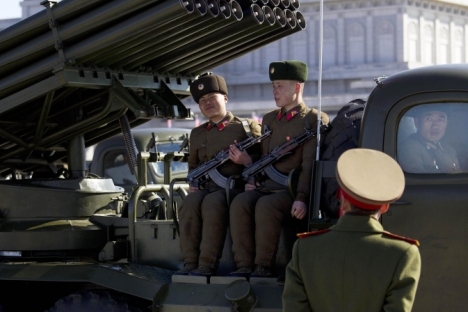 State Duma Defense Committee Deputy Chairman Franz Klintsevich (United Russia) has urged economic sanctions against North Korea to be imposed by the UN Security Council. "I am confident that the UN Security Council will evaluate the latest nuclear test conducted by North Korea. Personally, I would support strict economic sanctions against the country which continues to obstruct international monitoring," Klintsevich told Interfax on Tuesday. He emphasized that North Korea issued an early test notification to South Korea and Japan but did not do the same for Russia although the two states had a common border. "That is a very serious factor but I am confident that our armed forces can intercept a North Korean missile in the case of an unsuccessful launch and nothing endangers our country," the deputy said. The ongoing nuclear tests in North Korea "show that the UN Security Council should not only impose economic sanctions but also categorically demand access of international monitors," he said. Although Russian authorities are concerned with North Korea's another nuclear test, some experts are skeptical about the country's nuclear potential. "Probably, North Korea has opened the door to the nuclear club but its capacity is zilch and the time span between the tests is very big," said Igor Linge, an expert from the Russian Academy of Sciences Institute of Problems in the Safe Development of Nuclear Energy. "Judging by historical experience, I think that North Korea will need five to seven years of work under colossal strain to join the nuclear club. I do not know if North Korea is capable of doing that. The mission may be accomplished if powerful resources are available," he added. "So far material is being produced quietly and seldom tests take place. And still the capacities are nil." Linge presumed that the North Korean nuclear test would not increase radiation levels in Russia. "Underground nuclear explosions can cause local contamination only under extremely unfavorable circumstances. There have been plenty of such tests, the experience is vast. There is no threat to Russia," Linge said. Other pundits argue that the nuclear test conducted by North Korea will lead to new sanctions. "Attempts to make the DPRK stop with warnings and sanctions are not quite successful," said Alexander Vorontsov from the Russian Academy of Science's Oriental Studies Institute. "The situation is not quite optimistic as anti-North Korean feelings are rather strong in the United States. The U.S. keeps on seeing a solution of this problem through the prism of stricter sanctions and bigger military-political pressure. Hence, new steps are inevitable." North Korea may stop nuclear tests only after Washington guarantees its security, he said. "It can be stopped only with serious negotiations and a serious agenda," the expert argue. "The DPRK has described its idea of security parameters more than once, primarily, as advancement towards real normalization with the United States. In the first turn, this means negotiations between the United States and North Korea, in which North Korea may receive real security guarantees." Nevertheless, some officials from Federation Council argue that the sanctions against North Korea are not effective and the world should revise its tactics towards North Korea and its nuclear program. "One should not get overly emotional right now," siad Viktor Ozerov, chairman of the Federation Council's Defense and Security Committee. "The rigorous sanctions applied to North Korea have proven ineffective, suggesting that the world community, including the six nations [involved in the talks on North Korea's nuclear disarmament] should change their tactics regarding Pyongyang and its nuclear ambitions. Adopting a new UN Security Council resolution on this problem at U.S. insistence would be a mistake." Rigorous sanctions produce the opposite effect, he added. "Only dialogue with Pyongyang can bring a real result," Ozerov said. "North Korea's nuclear potential represents a minimal threat for now, and its demonstration is a mere attempt to protect the country from foreign interference, something the Pentagon has been contemplating lately. North Korea has accumulated an amount of nuclear material sufficient to make a small number of bombs, but it does not posses the know-how to produce a nuclear warhead." Military expert and senator Radik Iskudzhin told Interfax that the world community is using the "carrot and stick" policy in talks with North Korea with "rigorous sanctions applied to Pyongyang now, and humanitarian aid sent to it then." "Perhaps it is time we changed our attitude to Pyongyang and opted for milder sanctions and stronger humanitarian and economic aid," he said. "North Korea is prepared to curtail military-nuclear programs if the U.S. gives up its hostile stance towards Pyongyang. Whether or not North Korea will retain a peaceful nuclear program, which in fact does not exist right now, is a matter of future accords and choice from a wide range of options. The program for economic and technical aid to North Korea, including energy supplies, has not been implemented fully to this day." North Korea's main goal is to secure additional concessions and additional economic aid from the six nations, he said. "This option could prove the most effective one for the world community," he said.